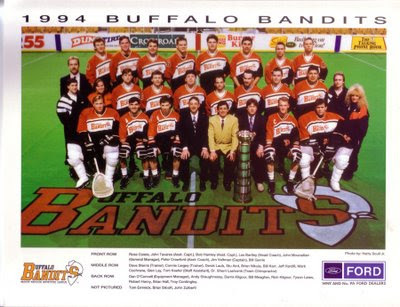 A pair of familiar faces were gone from the Buffalo Bandits roster for the 1994 season. Derek Keenan and Kevin Alexander had played big parts in the two championships in the team's first two seasons, but they had retired. Keenan would pop up later an an opposing coach. "I'm going to miss Derek, that's for sure," Jim Veltman of the Bandits said. "But players like myself are going to have to pick up the slack both on offense and defense. I'm planning to increase my scoring production." However, the team still had several key players back. The role of Troy Cordingley and Stu Aird figured to grow under the circumstances, while John Tavares, Veltman, Bob Hamley, Darris and Rich Kilgour, Ross Cowie and Bill Gerrie were all back. 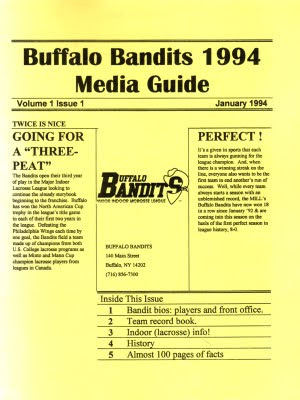 Assuming the transition of players could take place smoothly, the Bandits figured to be very good in 1994. Their league had lost Pittsburgh from its membership, leaving the MILL with six franchises. The Bandits started the season right on track. Buffalo defeated Detroit, 17-16, in the season opener on Jan. 23. That was followed by a home win against Baltimore two days later, a road win in New York, and a home victory over Philadelphia. The win over the Wings came in spite of a "mere" two-assist performance from Tavares. But Veltman had six points. "We told a lot of people prior to ever playing a game this season that we had depth all up and down the lineup," said coach Les Bartley, now 14-0 in his season and a half as head coach. "We raised the depth level all the way down the line. On any given night, anybody can score goals." That put the Bandits at 4-0 for the season, and on a 17-game regular-season winning streak. If you added the playoffs, the Bandits had won 22 games in a row. Finally, that streak came to an end on February 5. Boston defeated Buffalo by a 14-10 score, in Memorial Auditorium no less, before 16,284. "They ran, they hustled, they hit, they did all the things that we usually do," Veltman said. "Maybe it's the best thing that could have happened to us. We'll mull this one over and maybe we'll come out more disciplined next time. This probably takes the monkey off our backs." The Bandits bounced back to win in Boston in their next game almost a month later, but lost in Philadelphia. That set up the last game of the season, which was against Detroit with the National Division title at stake. Buffalo earned the win, 18-10. "We wanted to show them who the better team is," Tavares said. "And you've got to give credit to the coaching of Les Bartley tonight. He used some players who hadn't gotten a ton of playing time, and it helped. It gives guys like myself a little more rest." A 6-2 record wasn't up to the team's usual standards, but it was good enough. Tavares and Veltman were named to the league's first all-star team, and Aird was picked for the second. "It's a nice honor, surprising really, but I just don't think in terms of that kind of stuff," Aird said. Tavares earned league Most Valuable Player honors. The Bandits hosted Detroit in the division final on April 9, and came away with a 16-10 win. Darris Kilgour had the game-winning goal and was game MVP with two goals and five assists, while Hamley and Tavares had hat tricks. It was one of the best games of Kilgour's career, and it came after he returned from a shoulder injury. "It was very, very frustrating for me to watch those two weeks," said Kilgour, who had seven goals and 10 assists in his six regular-season games. "Not getting to play against Philadelphia, especially because we lost, was frustrating. We beat Detroit, but I had to sit in the stands and I don't enjoy doing that. Ever." That set up the MILL championship game in Buffalo on April 16, and it was a stunner. The Bandits' defense was abused to the tune of 26 goals by Philadelphia, and the Wings went away with the title, 26-15. Tavares and Veltman had three goals each, but neither Gerrie or Cowie had an answer for the Wings' Paul Gait, who was the game's MVP. And no wonder -- he had eight goals to set a record, and 11 points to set a record. Kevin Finneran had eight assists for the Wings, to set a record. The damage was particular bad in the second half, when the Wings went on a 19-5 rampage, including a 12-4 third-quarter run. Gait had seven of his goals in the second half. "I don't know if they ate some spinach in the dressing room at halftime or what," Bandits head coach Les Bartley said after his team's first loss in seven postseason games. "But once they grabbed that momentum, they went with it." "Take nothing away from them, but what they got, we gave a lot of it to them," Bandits forward Stu Aird said. "They got on a roll, and we just didn't do anything at all to stop it. Instead, we helped fuel it with our play. We couldn't get over the hump, and we have to blame ourselves for a lot of that." The team would have to wait a while for another championship.